Take the plunge into the Aquarium’s Great Maya Reef habitat lead by one of our Adventure Guides! This amazing snorkel adventure offers a face-to-mask introduction to some the aquatic animals at Audubon Aquarium of the Americas. Your ticket also includes admission to Audubon Aquarium of the Americas before or after your scheduled time! Come face-to-mask with over 30 species of marine life. Play hide-and-seek with cownose rays, Caribbean lobsters and hundreds of beautiful tropical fish. Discover the intricate and diverse life supported by reef habitats. Learn about our conservation efforts. Experience the Aquarium’s marine creatures like never before. Includes admission to Audubon Aquarium of the Americas before or after your scheduled time. Each time slot is limited to a maximum of 4 participants. 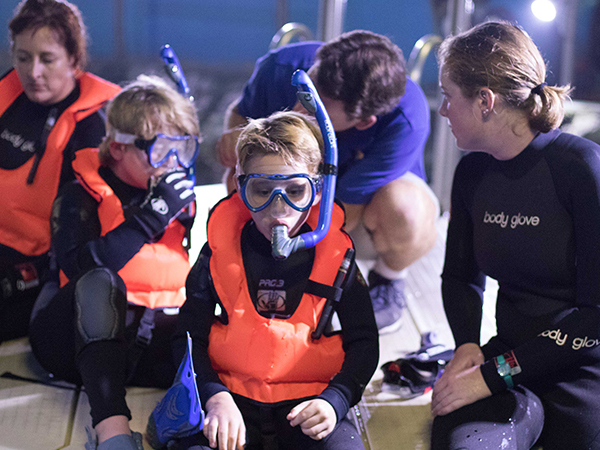 Snorkel experience is open to anyone 8 years and older. Those under 18 years of age must be accompanied by a paid, participating adult. Last ticket is sold 1 hour prior to the beginning of the Maya Snorkel Adventure. Book online, at one of the Aquarium's ticket windows, or call 1-800-774-7394 and ask about the Maya Snorkel Adventure. Snorkel experience will last approximately 1.5 hours, with about 40 minutes in the Reef. Check in at the Aquarium’s Information Booth 15 minutes prior to your scheduled Maya Snorkel Adventure. Remember to bring your ticket with you. Mobile passes accepted. Non-participants (friends and family) must observe from the exhibit public space. The best viewing area is at the Great Maya Reef Tunnel. They will be able to see you approximately 30 minutes after your adventure begins. Each participant must bring their own swim suit. Personal dive gear is not permitted, but guests may bring their own masks. Guests with allergic sensitivity to marine animals should be aware that this is a simulated ocean environment. If you do not show up or cancel at least 48 hours prior to your experience you will forfeit the entire price of your Wild Encounter. Please call 1-800-774-7394 at least 48 hours before your scheduled appointment to cancel your visit. Leave call back information, confirmation number, date, and time of your visit for valid cancellations. The Maya Snorkel Adventure will be automatically canceled if party arrives later than 15 minutes after scheduled program time. Payments will be processed as a donation to Audubon Nature Institute. Audubon Aquarium of the Americas is not responsible for unauthorized duplication, lost, or stolen tickets. In the event that duplicate copies appear, the facility reserves the right to refuse entry to all ticket holders. Tickets are not for resale. In the unusual event facility staff is unable to provide this program on the date scheduled, the participant is entitled to reschedule an alternate date, or to receive a refund.